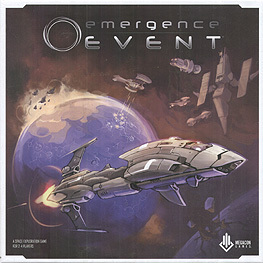 Emergence Event is an exciting new competitive space exploration game for 2-4 players. Players seek to explore and control locations in the galaxy to gain the resources, artifacts, and technology to help them face more difficult encounters later in the game. Each player controls a captain in command of their their species’ flagship. With a unique deck of captain cards, individual strengths, and special abilities, each captain offers players a very different game experience. Made up of modular tiles, the galaxy is very different each and every time you play, allowing for great replayability and unique challenges with every game.